The Cello Concerto by Robert Schumann is filmed deep in the bowels of an evocatively derelict submarine bunker. 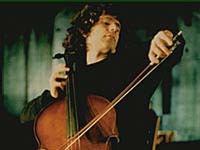 With stunning performances by Steven Isserlis, conductor Christoph Eschenbach, and the Deutsche Kammerphilharmonie Bremen, the film brings alive the emotions of one of Schumann's greatest compositions. "The surreal landscape of the performance, the wonderful romantic experience this music creates, and the cinematography all combine to present a(n) extraordinary introduction for all ages to this piece of music, to classical music in general, and to the modern interpretation of classical music."